A Costa Rican woman has told how she recovered from a brain aneurysm after praying to Blessed Pope John Paul II – the second miracle attributed to the pontiff, who died in 2005. Mora said that the incident occurred after she returned from the doctor’s and watched the beatification of the former pope on television. As she prayed, she heard his voice speak to her from his picture on the cover of a magazine. After the incident, Mora’s condition rapidly improved and doctors could not explain the reason for this. According to Reuters, her neurosurgeon, Alejandro Vargas, admits Mora’s condition was potentially fatal, but says he predicted only a two percent chance that it would kill her. 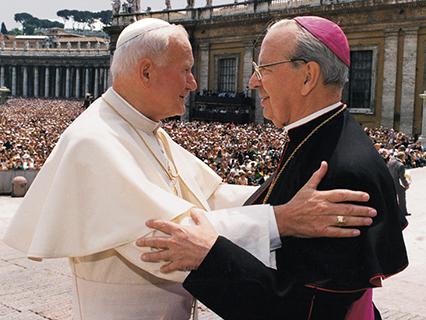 Not only JPII is getting a miracle attributed to his intercession but also the Venerable Bishop Alvaro del Portillo, the second leader of Opus Dei, has been credited with a miraculous healing. It was reported that in 2003 a newborn who suffered a major cardiac arrest and was declared dead, came back to life after his parents prayed for Bishop del Portillo's help. This time it is EWTN News who gives more information. The miracle involves the August 2003 healing of Chilean newborn Jose Ignacio Ureta Wilson. A few days after his birth, the boy suffered a 30-minute period of cardiac arrest and a major hemorrhage. The medical team treating the baby thought he had already died, but his parents prayed for healing through the intercession of the bishop. The baby’s heart started to beat again and he recovered to live a normal life. There are many medical results we do not understand. Spontaneous remission of cancer, for example, occurs in a reliable but small fraction of the population; no immediate explanation can be presented on a case-by-case basis. The problem, however, is that when one examines the spontaneous remission rates in the general population from diseases such as cancer, the rate is actually higher than that reported among the Lourdes pilgrims. (*Sagan pointed this out, but others have also compared medical reports and Lourdes reports.) Thus, if you bathe in the Lourdes waters, you apparently have a smaller likelihood of being spontaneously cured than others who have not. The LA Times article makes some very good points... about the wrong things. If you go back and read closely Ms. Mora's and young Jose Ignatius' healings were not a random event, like the spontaneous cures used as counter arguments by the LA times. These miracles were the result of prayer triggered by the desperation of the faithful. Completely different events than say someone who wakes up one morning and finds themself free of cancer. The point I'm trying to make is that the LA Times explicitly uses a rather limited definition of miracle, first proposed by medieval philosopher's Baruch Spinosa; for whom a miracle was "a violation of the order of nature" ("Tract. Theol. Polit. ", vi). Catholics have a much broader view of what constitutes a miraculous event. To quote Aquinas: "Those effects are rightly to be termed miracles which are wrought by Divine power apart from the order usually observed in nature" (Contra Gent., III, cii). The LA Times focuses the attention of the reader on the seeming violation of natural order; the instantaneous healing of a sick (or dead) person, while for the Church this violation is not enough to be declared a miracle. The event needs to happen within a religious context. As a man of science, I'll admit there is some probability that there is a natural mechanism we do not yet understand, perhaps a sort of biological trigger, which, under the correct set of conditions would actuate the spontaneous healing of a brain aneurism or even jump-start a heart that was paralyzed for 30 minutes. Who knows if in the future doctors would be able to use this mechanism routinely. As a religious person I understand that God uses what we call "randomness" to interact with His creation, at His own will and pleasure. I also understand that God hears the prayers of all those who call for his help, even those without faith. Who knows, perhaps all those unexplained healings referred to by Krauss are just the result of this type of "unbeliever prayer". As a Catholic I know that the intercessory prayers of many or even a few (In these cases the few included JPII and Bishop del Portillo) have a tremendous influence on the way God interacts with His creation. I also understand that the miracles approved by the Vatican were not just spontaneous healings but the results of faithful prayer from those seeking God's help, and actuated by God's desire to bring glory to Himself through His creation. In referring the miracle to God as its efficient cause the answer is given to the objection that the miracle is unnatural, i.e., an un-caused event without meaning or place in nature. With God as the cause, the miracle has a place in the designs of God's Providence (Contra Gent. III, xcviii). The difference between these two understandings of miracles (Spinosa vs Aquinas, LA Times vs Catholic Church) is very important. Think about this for a second: what would happen if in 20 years or so medical science were to discover how to trigger a currently unknown biological mechanism which will cause the healing events Ms. Mora and young Jose Ignatius experienced? According to Spinosa's and Mr. Krauss's idea of a miracle, since now we understand and can repeat the natural conditions to trigger the healing for someone with the same type of condition, this event was just an act of incredible luck, which did not require divine intercession. This will put into question the infallible sainthood declaration (Canonizations are considered infallible declarations) of two servants of God, JPII and Bishop del Portico. By using Aquinas idea of a miracle the Church avoids the dependency on an inexplicable event which could be explained later as our understanding of the natural world expands. Under this view the healings of Ms. Mora and young Jose Ignatius were not triggered randomly, they were the result of a direct petition for intercessory help. There is nothing miraculous about the result of some random event. But when a perfectly rational person receives a divine command to, "Rise! Don’t be afraid" after praying for healing, or parents ask in desperation for the life of a dead baby, and these prayers are clearly answered precisely in the way the petition was made, regardless what mechanisms God uses, the final result still remains a miracle, given to us by the mercy of God, who answered the prayer of His children in a moment of need. Of course atheists would claim that prayers can not be taken seriously because it cannot be reliably shown that they are answered. The LA times implies this when they report that on the average there are more unexplained healings than the type of healing reported by the Vatican. But perhaps this is caused because the effort the Vatican places in finding a natural explanation is more stringent than those, like the LA Times, who attach the word miracle to every un-explainable healing they find. I hope this helps put in perspective the criticism of the secular media, which wastes no time to misinform and confuse all things Catholic-wise. Yes, the stringent analysis given to the miracles at Lourdes very likely dismisses a huge portion of legitimate miracles that do not meet the criteria. Great article. I wonder how the juornalists, seculars and atheists would explain away the miraculous healing of Colleen Willard after she was prayed over by the Visioonary Vicka. Near death from 7 different illnesses: all of which were life threatening Coleen was miraculously healed during Holy Communion. Many, many people were witnesses to this fact and her doctor's at the Mayo clinic can attest to her miraculous restoration to complete health. I do not know if you are familiar with her story. Her full testimony-to The Glory of God-is available on, You Tube where Coleen is talking to a priest of, The Marian's of The Immaculate Conception". As I understand it, miracles are considered an acceleration of nature. Nature then, as order by God, reacts within natural law, but in an accelerated rate. But mankind has not discovered this mechanism to accelerate nature so far and quite possibly never will for if God as the master and creator of nature designed its laws and limitations to react as it does then as its commander and Lord then can create natural events from nothing, as he did in the beginning. Anonymous 1: Thanks for your kind words. I'm working in another post about the miracle of the Sun in Fatima. Stay tuned! Anonymous 2: Thanks for your kind words I don't know of Ms. Willard story, I'll do some research. Anonymous 3: I would say it another way. As I see it, an "acceleration of nature" is just a change in time's rate of change, a perfectly natural event as described by Einstein's General Theory of Relativity, where depending on mass, and speed the rate of this change varies. I rather say that God can "suspend" the laws of nature (but never violate).